This can be done with one or more children. Invite a child to come with you. Have him unroll two mats and bring the material to one mat. Place a small mat between the two larger mats and place the tray onto the smaler mat. Have the child put out the unit beads in a vertical row from 1 to 9 from the top of one of the large mats. 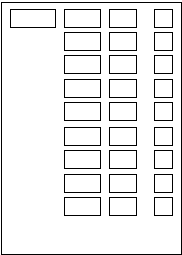 Have the child put out the ten-bars to the left of the unit beads in a vertical row, the hundred squares to the left of the ten-bars, and the 1000 cube to the left of the hundred squares. Have the child place the large cards 1 – 1000 (only 1000) on the other large mat as in the Introduction to Symbols exercise. Choose a card from the layout and give it to the child for him to put it on his tray. Ask the child to go and get the amount of beads written on the card. The child should take his try with the card on it to the mat with the beads and collect the correct amount of beads. Have the child place the beads onto the samller mat and count to check. Have the child replace the material from his tray and repeat by giving him another card. After some time, reverse the activity by giving the child an amount of beads. Have him count the beads and then go get the corresponding card to match the number of beads. Check the child’s work with him. Have the child replace the material from his tray and repeat. Once the child seems to understnad, give him two cards such as 20 and 3. Have the child name then: 2 tens and 3 units. Have the child go to the mat and collect the correct amount of beads. When he comes back to the small mat, check his work. Repeat using the hundred cards and the one thousand card. After a while, reverse the activity by giving the child an amount of beads to which he must find the correct corresponding card. Begin with one catergory (such as units). 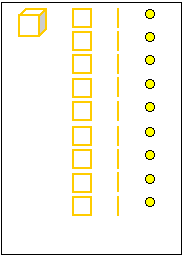 Later move one to two adjacent catergories (such as units and tens), three adjacent categories, and four adjacent categories. Then non adjacent categories. Have the child bring over (for example) 1426 in beads. Have the child bring over the corresponding cards. Place the 400 card on top of the 1000 card with both of their left sides lining up. Place the 20 ontop in a similar manner and then the 6. Pick up the cards by holding then from the side near the far left. Rotate them up vertically clockwise. Slide the numbers down to the lower side. Place the cards back onto the mat and then number you have created is 1426. Read it saying: 1 thousand, 4 hundred, 2 tens, and 6 units. Have the child repeat it with you. Read it again but this time saying: one-thousand, four hundred and twenty-six. Read it again with the child. Have the child replace the material back onto the correct mats and repeat. To make the child familiar with the different categories of numbers, especially with regard to reading the symbols. For the hierarchy of numbers, that is, that while the significant figure are always from 1 to 9, it is the place they occupy in the complex number which gives them the importance of 1, 10, 100 or 1000. For the fact that in a large number made up of two or more categories, the zero merely shows an empty place. That is, that one of the categories is lacking (in 1065, for instance, the hundreds are missing). For the fact that only 9 of each category are necessary to form any number. If the directress perceives any slip, then she should ask the child to read out the symbol and count ever the quantity of beads which he has brought. This will make him aware of his mistakes.